← Bits Of Our Weekend. I took her with me to Target to pick up a few things I’d been thinking of for Christmas, and to buy out everything they had in the dollar bins. 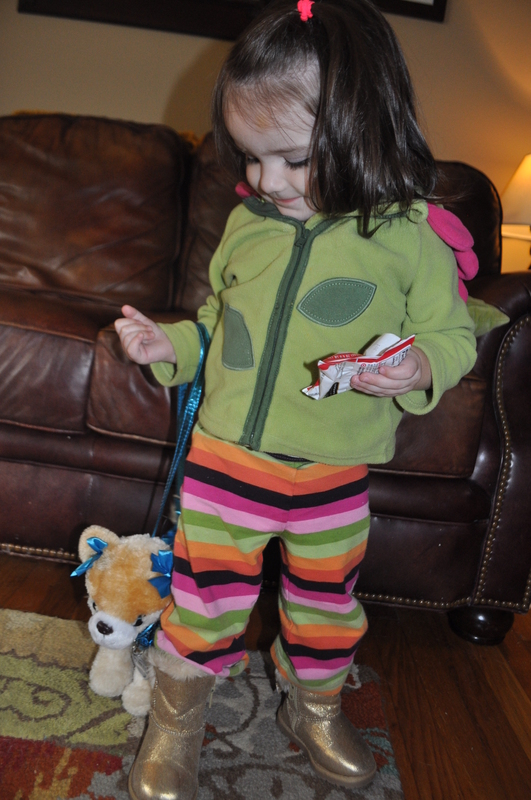 So my cart had a ton of little dollar bin items when I walked past one of the things I’d been thinking of for her: a dog purse. Now, doesn’t that seem silly? I honestly would never have even considered it or thought of it, except one of our friends had one last year and all the little girls in our playgroup loved it. Anyway, it’s a stuffed animal dog, with sequins (!! ), and it’s a purse. Weird, but I thought she’d love it. So I picked it when she wasn’t looking, and shoved it under my dollar bin stash. And we made it all the way through Target and to checkout. And it was on the checkout, and she was looking at me and I felt she was definitely distracted when — lo and behold — I’d picked up the dog purse that had no price tag. So the guy is holding it up, and opening it up, and looking all around for the price and I couldn’t keep her distracted during all of that going on — so she saw it. But Alice was not deterred. And then she twisted around, even though she was buckled, and practically threw herself into the back of the cart to try and reach the bag with the doggy. And she smiled like it was Christmas morning. She immediately put it on her arm and wouldn’t take it off for anything the entire rest of the day. 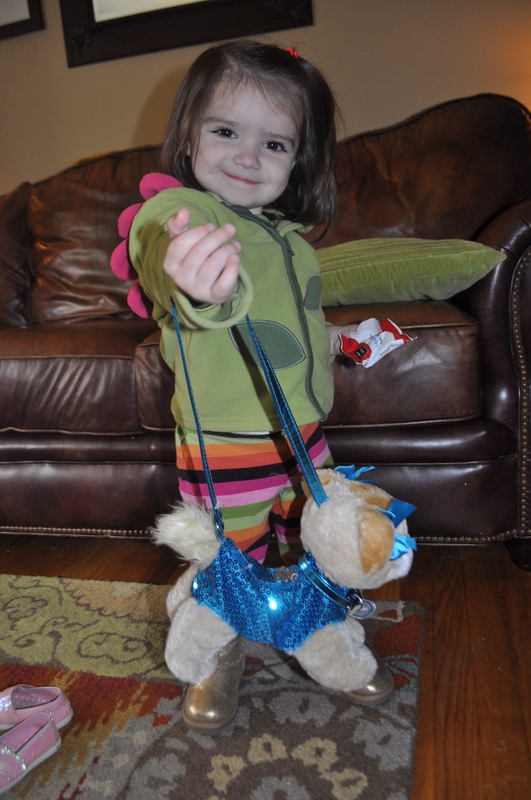 She’s carried it around ever since — a blue sequined doggy purse. Santa is so happy you love it. 2 Responses to Merry Friday! 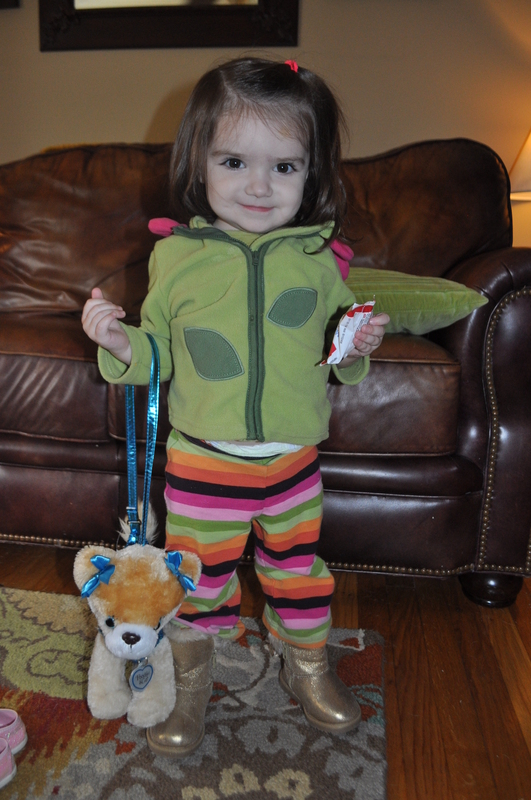 Her boots are the coolest!